What could influence the outcome? The Republicans hold the Presidency and majorities in both the House of Representatives and the Senate, but Democrats will be looking to break this stranglehold at the 6 November mid-term elections. All 435 House of Representative seats are up for grabs along with 35 of the 100 Senate seats. By gaining control of either the House or the Senate (or both), the Democrats would have the ability to severely restrict President Trump’s policy agenda while increasing the possibility of impeachment proceedings being initiated against the president. However, if the Republicans retain control of Congress, this could inject a new impetus into President Trump’s legislative plans with more fiscal stimulus, more protectionism and potentially an even more belligerent approach to politics both at home and abroad as we've detailed here previously. In the House of Representatives, the Republicans have a majority of 24, holding 237 seats versus the Democrat’s 193 seats with five vacancies. As such, the Democrats need to make a net gain of 25 seats to win control of the House. In the Senate, it is closer with the Republicans holding a majority of just 51-49 in the 100 seat chamber – although they can rely on the Vice President’s deciding vote in the event of a tie. However, of the 35 seats being contested in November, the Democrats have 24 up for election along with the two independents, while the Republicans only have nine seats. As such, the Democrats need to win two of the nine Republican-controlled Senate seats, while holding on to all of the seats they currently occupy to gain control of the Senate. Members of the House of Representatives serve two-year terms where-as the President has a four-year term and a Senator has a six-year term. Senators terms are staggered so one-third of the 100-member Senate are up for re-election every two years. This year there are 33 Senate seats being voted on in regular elections with two an additional two special elections due to Senators resigning before their term ended. For more details on election scenarios and potential economic and market implications, read our earlier note: US mid-term election preview: Feeling Blue? 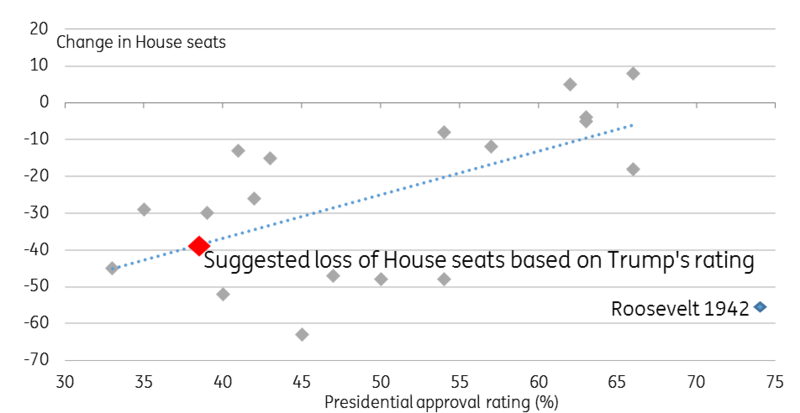 It is important to bear in mind that the President’s party typically loses House seats at mid-term elections – only three out of the last 21 mid-term elections going back to Franklin D Roosevelt’s presidency in 1934 have seen gains (nine seats for Roosevelt in 1934, five seats for Clinton in 1998 and eight seats for George W Bush in 2002). Moreover, the 25 seat turnover the Democrats need this time has been achieved on 11 occasions since 1934 and in two out of the last three mid-terms. The median loss of House seats since 1934 has been 26, one more than the Democrats need to win control of the House. As for the Senate, the Democrats will have their work cut out to win, not least, as 10 Democratic senators are running in states that President Trump won in 2016, while only one Republican is defending a seat in a state (Nevada) that Hilary Clinton won. To gain a majority in the Senate, the Democrats will need to win races in the traditionally Republican territory but will point to their victory at the Alabama special election last December as a source for optimism. 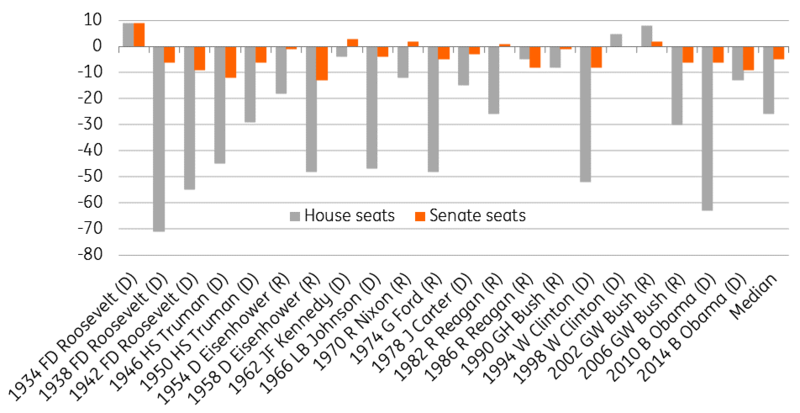 In the Senate, the incumbent President’s party has gained seats on five occasions and lost them 15 times with one no change outcome since 1934. The median change in the past 21 occasions has been a loss of five seats, which would see the Democrats gain a majority. However, given the map heavily favours Republicans this time around with only nine of their Senate seats up for a vote, the odds suggest the President’s party will hold on to a slim majority. The four key factors include: the President’s personal approval rating, the generic polling of the parties, the health of the economy and campaign financing. The concern for Republicans is they only really have the economy going for them right now. President Trump’s personal approval ratings are just 38%, which is the lowest of any President in the September of their second year of a term since Harry Truman (in both 1950 and 1946 when he lost 29 and 45 House seats respectively). Approval ratings of less than 50% at this stage of the election cycle typically see a loss of Congressional control for the President’s party, as seen with Reagan in 1982, Clinton in 1994, George W Bush in 2006 and Obama in 2010. However, amongst Republican voters, Trump has an 85% approval rating, so to have a chance of success, the Republicans need to use this to generate a high turnout from their base and hope complacency depresses the Democrat vote. The additional problem is that polling for the Republican Party isn't great. 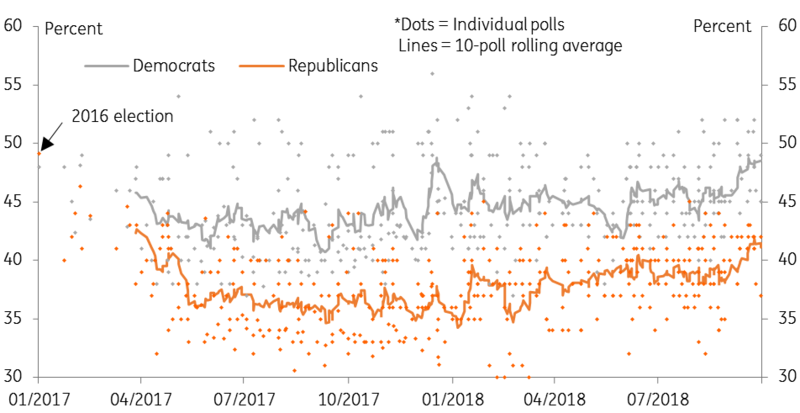 Opinion polls generally suggest the Democrats are around 7-8 percentage points ahead of the Republicans across the nation. But Republicans have something of a built-in advantage because their voters appear more optimally distributed across House districts. That’s partly because Democrat voters tend to be concentrated in cities. But also because Republicans controlled a majority of state governments at the time of the last redistricting in 2010, which they used to increase their advantage by through a redrawing of several constituency maps. Indeed, several statisticians, including Nate Silver, founder and editor in chief of FiveThirtyEight, believe that even a five percentage point win in the popular vote for the Democrats would only give them a slight advantage in House seats, so the race is perhaps closer than the polls alone suggest. Also, note that there is a fairly high 15% of voters polled that are undecided. At the same time, there has been a wave of Republican politicians who are not going to contest their seats, the most notable being House speaker Paul Ryan and the senators from Arizona and Tennessee (who have both conflicted with President Trump). These “open seats” have historically been more difficult to defend because incumbents often have a significant advantage over challengers due to better name recognition, stronger fundraising networks, and experience of campaigning. The electorate may also see a high number of resignations as a sign that all is not well within a party, which can influence swing voters. As for fundraising, Federal Election Commission data as of June shows between January 2017 and June 2018, House and Senate candidates running this year had raised US$1.7bn and spent US$1.1bn. According to an analysis by Politico, 56 incumbent Republicans have raised less money than their Democrat challenger in the three months to July. Money doesn’t guarantee anything, but money together with an engaged and active local support network is certainly a clear advantage. President Trump remains incredibly popular with Republican voters (85% approval according to Gallup) so getting them to turn up will be key to defending many seats. If Democrats vow to impeach the President this could motivate Trump supporters to vote for Republican candidates. If there is complacency amongst Democrat supporters this could see the Republicans hold onto a majority. An increasing number of associates of Donald Trump have become embroiled in legal cases with convictions against Paul Manafort, his former campaign manager and Michael Cohen, his former personal lawyer the latest headache. Further trials are in the pipeline and there is the faint possibility Trump is called to testify. If evidence emerges linking President Trump and Russia the situation would likely be detrimental to the Republican cause. Hillary Clinton supporters argue that the FBI’s decision, under James Comey, to reopen the investigation into her emails just days before the 2016 Presidential election damaged her and handed the Presidency to Donald Trump. There is the possibility an announcement from Robert Mueller, either way, could have an impact on this election. Likewise, President Trump firing Mueller, which he has apparently been talked out of doing before, or the replacement of Jeff Sessions as Attorney General could have implications. The economy continues to perform very well, but this doesn’t appear to have boosted the prospects for the Republicans. Even President Trump’s tax cuts – his signature domestic legislation achievement – have provided less traction with the electorate than Republicans hoped. Instead, the worries about protectionism and emerging market woes could intensify. Unchecked, risk aversion could become more evident and equity markets come under pressure. A market correction could have negative consequences for the Republicans. Few political decisions have more far-reaching effects than appointments to the US Supreme Court, where judges serve for life. So the Senate’s decision whether to approve Trump nominee Brett Kavanaugh matters enormously to both parties. Allegations of misconduct against Kavanaugh may have a negative impact on Republican candidates who have backed his nomination. But it is also possible that if his nomination is delayed or withdrawn, the prospect of a Democratic Senate majority blocking Kavanaugh (or another Trump nominee) increases Republican voters’ motivation in the mid-terms. The points above on balance pose more threats than positives for the Republicans. Given the state of current polling, it’s therefore not surprising that most professional political forecasters consider the Democrats favourites to win a majority in the House. However, virtually all see continued Republican control of the Senate as the most likely outcome. Betting market prices also indicate this combination – Democrat-controlled House and Republican-controlled Senate - as the most likely. However, we must also warn that electorates can spring surprises. A strong poll lead now doesn’t mean victory is assured, just ask Hillary Clinton or Theresa May in the UK. The chance that the Democrats win the Senate but not the House is considered negligible.